Meatballs, make-it-yourself furniture, dragon tattoos, and Ace of Base are some of Sweden’s greatest cultural exports, but nothing from the great Scandinavian country rivals the legacy of actress Ingrid Bergman. The iconic star of films such as Casablanca, Anastasia, and Autumn Sonata is best remembered as a classically composed actor with a magnetic aura and an adaptable charm. Her charisma and grace resonate strongly in romances like Casablanca, thrillers like Notorious, and poetic neo-realist dramas like Voyage to Italy. She loved movies, and the movies loved her, as Ingrid Bergman: In Her Own Words recalls with a loving and candid portrait of the late star. Hollywood history remembers Bergman’s personal life just as well as it recalls her movies with its well-documented account of the actress’s scandalous affair with Italian director Roberto Rossellini and her subsequent exile from Hollywood for several years. As an actress whose life reads like a legendary open book, one might think that everything there is to know about Ingrid Bergman is already public record. Her personal records might not tell a different story, but they let Bergman write her own history in her own words. Stig Björkman’s lovely documentary Ingrid Bergman: In Her Own Words draws upon the diaries of the iconic Swedish actress to offer a deeply humane portrait of one of the cinema’s greatest stars. The film presents Bergman’s personal reflections, narrated by Swedish actress Alicia Vikander (The Danish Girl, Ex Machina), along with an impressive collage of home movies shot by the Casablanca star herself. 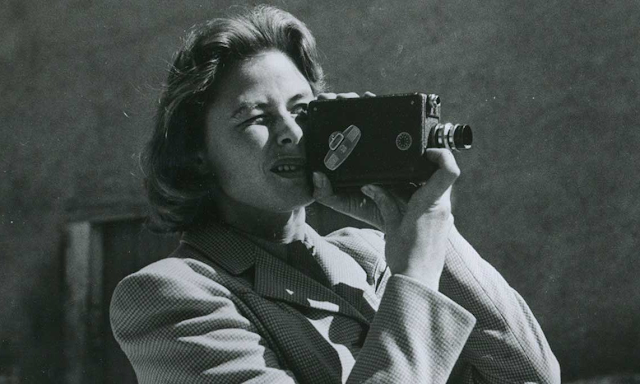 Ingrid Bergman: In Her Own Words is an intimate glimpse into one woman’s pure and unadulterated love for the camera. The film swiftly chronicles Bergman’s early years and ambitions to become a star as Vikander offers captivating readings of the actress’s recorded thoughts. In Her Own Words suggests that Bergman had a relatively easy rise in Sweden and was a natural fit for the camera thanks to an early bit part in which she stood out as an extra from a queue of fellow actors. Her early screen test for David O. Selznick conveys her magnetic screen presence and the glamorous innocence that defined her star persona for much of her career. The film briefly chronicles the actress’s first decade in Hollywood with fleeting mentions of Casablanca, Notorious, For Whom the Bell Tolls, and other landmarks in which the Dream Factory helped the Swedish star realise her greatest goals. Cut to the Rossellini years, however, and In Her Own Words digs deep into Hollywood scandal. The film invites Pia Lindström, Bergman’s eldest daughter who she had in her first marriage to Petter Lindström, to speak about her experience growing up within the centre of this high profile family drama. Lindström speaks fairly and frankly about her mother, as do Bergman’s three children from her marriage to Roberto Rossellini—Ingrid, Roberto, and famed actress Isabella—and all four offspring recount an ambitious, caring, and driven women whose main flaw was simply that she adored acting too much. Isabella Rossellini (Joy), who sounds identical to Bergman in the actress’s later years, offers the best and fullest accounts of her mother as she unpacks Bergman’s career, and perhaps her own experience in the business gives her more insight into the pressures of Hollywood, while Pia offers some intriguing psychoanalytic hypotheses to explain her mother’s allure for the camera. Bergman’s children all convey the observation that their mother prioritized acting over parenting, but they make these remarks without judgement and simply wish that she had been more present in their lives. They Rossellini kids, however, all provide stories that suggest that Bergman made more of an effort to balance work and family than their father did, all the while redeeming herself in Hollywood’s eye. The tapestry of home movies, archival footage, and diary entries plays off these personal accounts from Bergman’s family members, as do some from peers such as Liv Ullman and Sigourney Weaver, while a loving score by Michael Nyman brings the class and elegance of Bergman’s presence to the screen. Interviews with Bergman on talk shows and lifestyle programmes add to the insight that echoes in her diary entries, as Vikander’s youthful narration eventually fades to let the maturity of Bergman’s own voice complete the story. Ingrid Bergman: In Her Own Words wonderfully humanizes an icon who already seems so down-to-earth in her performances. It’s a warm, frank, and affectionate portrait. Ingrid Bergman: In Her Own Words screens at the Canadian Film Institute’s Bright Nights: The Baltic-Nordic Film Festival on Thursday, Feb. 18 at 7:00 PM at the River Building Theatre, Carleton University.